Monday, May 13, 2002... Greetings from Rapid City, SD, gateway to the Black Hills. Fourteen hours on the road, including a half-dozen major stops, and I haven't even seen the big sculptures yet. I-90 westbound across South Dakota is my favorite stretch of Interstate. Not because of the scenery (there's one scenic view in 350 miles), but because of the billboards. They start hundreds of miles before the attractions they advertise, building anticipation -- and except for a few chain restaurants and motels, they're all locally made, promoting local businesses. Propertyowners even debate political issues via billboard. The National Abortion Rights Action League bought one sign just down the road from a Knights of Columbus anti-abortion message. A sign near Alexander, in the eastern part of the state, proclaims, "We Dakotans REJECT Animal Activists. Fur, Game, Fish and Livestock Are Our Economy." 250 miles later, someone else advises, "Help Manage Your Wildlife -- Wear Fur." But most of the billboards promote for mom 'n' pop attractions of the kind that have largely been supplanted elsewhere by theme parks. I stopped at most of them, starting with the civic auditorium that doubles as a bird feeder, Mitchell's Corn Palace. 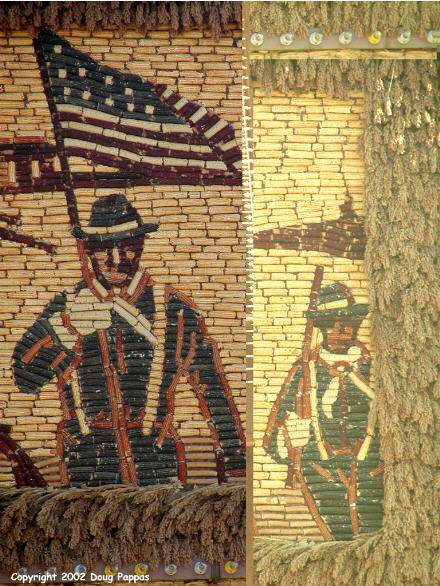 As usual, the exterior walls of the Palace are covered with murals made by nailing thousands of ears of corn to wood. These decorations are changed every falll, just before the Corn Palace Festival. A local corn geneticist spends most of his time trying to create new colors. Inside, the stage and basketball court are set for Mitchell's high school graduation ceremony, scheduled for next weekend. The school's sports teams are called the Kernels; a local radio station is KORN; and ears of corn are carved into the base of all the downtown lamp posts. AAA also recommends the "Enchanted World Doll Museum" opposite the Palace, but since on my list of favorite adjectives, "enchanted" ranks right up there with "tubercular," I gave it a miss yet again. An hour west of Mitchell, a bluff overlooking the Missouri River provides the route's one scenic delight, a view that proclaims, "Here is where the West begins." Each of the river, cattle graze in pastures and towns can be spotted from a distance by their cluster of trees, but from the west bank to the Black Hills, trees are scarcer than PETA members. The river also marks a 200-mile stretch in which no community has as many as 1,000 residents In most, Main Street and the I-90 Business Route, if any, are the only paved roads. One of these towns, Murdo, has a people-to-antique-cars ratio of about 2.5:1, thanks to the Pioneer Auto Show and Antique Town. The Auto Show displays several hundred cars, including a Dukes of Hazzard "General Lee," as well as Elvis Presley's motorcycle, while the Antique Town assembles old buildings and their contents. 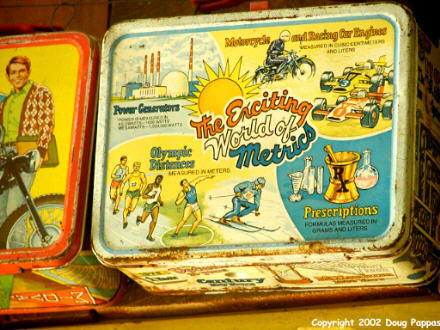 One wall also displays the lunchboxes of a generation ago: "Charlie's Angels," "Pac-Man," "Disco Fever," and one whose purchaser should have been arrested on the spot for child abuse: "The Exciting World of Metrics." 20 miles down the road stands the "1880 Town." If it looks like a movie set, that's because most of it was. The owners originally operated a gas station on the site, but saw their opportunity when a film company constructed a Western set nearby. They bought the set, began collecting old buildings from the surrounding region (an easy task, since the remnants of failed townships are scattered all over the Dakotas), and really hit the jackpot when "Dances With Wolves" was filmed nearby. They bought many of the props and some of the animals. (For some reason, one exhibit also contains memorabilia of the Boston Red Sox' retirement of Bobby Doerr's number.) While I'd rather carry an Exciting World of Metrics lunchbox than sit through "Dances with Wolves," I passed a pleasant half-hour exploring the town. A blackboard in the old one-room schoolhouse is reserved for modern graffiti, so I added the customary tribute to John McGehee's late mother. Next stop: Badlands Petrified Gardens, family-owned since 1956. This is one of the simpler attractions: distribute a truckload of locally-harvested petrified wood around the yard, label it for the geologically challenged, add a few roomsful of interesting fossils and unusual rocks, and lay in some extra rocks and fossils to sell as souvenirs. An unintentionally hilarious chart near the rocks, presumably a response to creationist criticism of the fossil dating, gave a parallel Biblical chronology which counts 1656 years between the fall of Adam and Eve and the Flood. I was approaching the Badlands, but since their colors are sharpest in the early morning or late afternoon light, I decided to double back later in the day. Instead I continued to Reptile Gardens, which displays America's largest collection of venomous snakes. In addition to the snake show, Reptile Gardens features a gator-wrestling exhbiition and an "enchanted village" show with trained birds and rabbits performing tricks, as well as the opportunity to play tic-tac-toe against a live chicken. I passed.